It’s spring, and the end of another weary, wartime winter. What could be finer than a bunch of Cornish daffodils, to brighten the home? 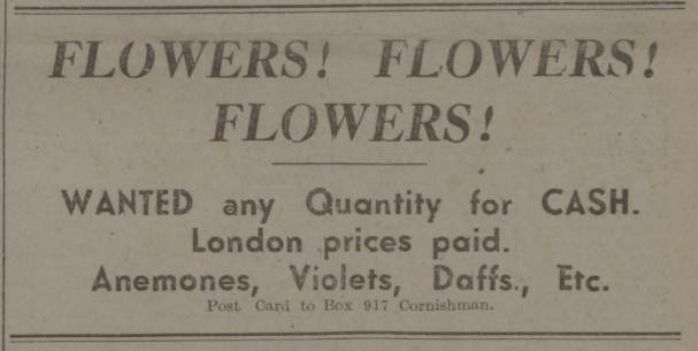 A dealer who only gives a box number is crying out on the front page of the Cornishman for “Anemones, Violets, Daff.s, Etc”. He will take “any Quantity, for CASH”. He will pay “London prices”. But how to get the flowers to London? That’s where things get tricky. Last weekend, some were found hidden in a crate of broccoli at Paddington, and sent back home, together with a railway detective charged with rooting out the smuggler. And today Stephen Collins and his boss John Reynolds, Newlyn men, are up in court, charged with misusing petrol coupons issued only for fish. It’s all about the war effort, you see. Everyone doing their bit. And how is ferrying flowers from Newlyn Quay to Madron – or on the train up to London – going to help that? Back in the winter, there was quite a racket going on. A “ramp” as they called it. Well, everyone has to make sacrifices and it's broccoli and fish that people need. Nobody needs flowers. It’s not flowers that will beat Hitler, put paid to Goering. Mr Reynolds is doing the talking, Mr Collins being charged only because he was the man at the wheel, and Mr Reynolds has a defence. He points out that his licence covers not only fish, and fish empties, but also “etc, etc”. There it is, in black and white, as issued by Mr Fallon the Certifying Officer. Only the previous week, the lorry carried sand and stones. Mr Reynolds has been in the trade for 20 years. He has hauled all manner of things. What else could “etc, etc” mean? The case is dismissed, and Mr Reynolds and Mr Collins leave the courtroom happy. Perhaps they go for a pint to celebrate, over at the White Lion or along at the London. But the next pair of defendants are not so lucky. The van belonging to Avis Nurseries has also been seen on Newlyn Pier, trundling along with seven boxes of daffodils for local sale. He is an established local businessman, entitled to transport “market garden produce” and contends that this means more than just potatoes. The defence solicitor – perhaps emboldened by his earlier success – is eloquent: with the price of flowers rising to “such an absurd height”, he explains, “many people… who did not know the difference between a violet and a primrose, rushed in …. to grab for what profit they could”. Unlike his client these were pure opportunists, with no High Street presence. And there follows a third case, where a lorry was merely taking flowers over to St Ives as a favour rather than returning empty – taking the flowers, moreover, to a woman struggling to keep her shop going while her husband was away on wartime service. But in each of these cases, the defendants are found guilty. The owners of the businesses are charged £1, their drivers ten shillings [50p]. The court has done with flowers for today. It can turn its attention to a case of drunkenness, a blackout offence and a runaway horse.